Everett Ruess, a 20-year-old vagabond, poet and artist who vanished in the Utah wilderness in 1934. His is one of the mysteries described in The Disappearances. Fort Lewis College, Center of Southwest Studies, Ansel Hall. “A helluva place to lose a cow,” Mormon pioneer Ebenezer Bryce allegedly quipped about the southern Utah scarp of hoodoos that still bears his name. And not just cattle, but even smart people with maps and survival gear have vanished into the folds of the Colorado Plateau’s convoluted topography. Dreamers and adventurers have long been drawn to the region, for various reasons. Spanish explorer Garcia López de Cárdenas first peered into the Grand Canyon while chasing the Seven Cities of Gold; early trappers like Antoine Robidoux sought wealth of the furry kind, and Brigham Young his God’s Promised Land. In 1869, John Wesley Powell came through, but three crewmembers left before the expedition’s end, only to be killed by Mormons or perhaps Paiutes — nobody knows for sure. To this day, spellbound wanderers seek out these canyons; some never leave, ultimately adding their bones to those already enriching the barren ground. Among the more famous missing are Glen and Bessie Hyde, Jazz-Age honeymooners who hoped to cash in by becoming the first couple to float through the Grand Canyon. (Brad Dimock deftly speculated about their end in Sunk Without A Sound.) A few mysteries were ultimately solved: Twenty-five years after he flipped his boat in the Grand Canyon’s 24.5-Mile Rapid at age 80, Colorado River legend Bert Loper’s remains showed up on a beach at Cardenas Creek. According to the meticulous roster Thomas Myers and Michael Ghiglieri compiled in Over the Edge, at least six people rest in obscurity in the Grand Canyon alone. The Glen and Bessie Hyde rescue expedition at Spencer Canyon on the Colorado River in the Grand Canyon in 1928. Northern Arizona University, Cline Library, Kolb, Emery, 1881-1976. 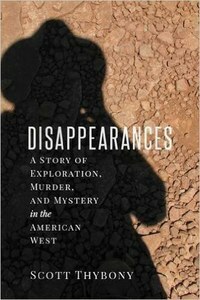 Interspersed with boots-on-the-ground research that took him from Texas to southern Utah, the book probes the fate of three of those who got into trouble during the 1930s: Lucile Garrett, a woodcutter’s daughter from Oklahoma, who fled west with the fugitive who murdered her father and lived with the killer in an isolated canyon along the San Juan River; Dan Thrapp, a 21-year-old paleontologist on leave from the American Museum of Natural History, who disappeared on his search for undiscovered cliff dwellings in Dark Canyon near Blanding, Utah — “Indian Legends Lured Lost Man,” one Salt Lake Tribune headline shouted; and the iconic Everett Ruess, a footloose, romantic artist from California who vanished in the Escalante region in 1934. His final tracks led into Davis Gulch, where only his pack burros, a bridle, and graffiti spelling out NEMO were found. Some sleuths think that cattle rustlers or Indians murdered the youth and hid the body (W. L. Rusho, The Mystery of Everett Ruess; David Roberts, Finding Everett Ruess), but others surmise he staged his own disappearance to live incognito on the reservation with a Navajo wife. “In a country where canyons lie sunk within canyons and tiers of cliffs stack one on top of another, the mysteries come layered,” Thybony writes, and the three stories he traces take some unexpected turns. According to his findings, Ruess fell into a rock crevice while exploring near an alcove campsite, and his decomposing body washed down Davis Gulch with the monsoons. Thybony investigates the “murders and even the madness” his protagonists suffered as a way to grasp “the wonder and dread they had experienced in a place so different from any they had known before.” Dark tales intrigue this writer, who also has long suspected that Ambrose Bierce, supposedly shot in Pancho Villa’s revolution, took his own life somewhere in the Grand Canyon. Although that theory remains unproven, the riddle of one modern-day disappearance was recently solved. In 2010, a man wounded a Utah state park ranger at a trailhead near Moab and then fled into the sandstone void. Police combed the area to no avail. But in late December 2015, a local college student and his teenage brother — sons of a Moab police detective who’d participated in the 2010 search — found Lance Leeroy Arellano’s bones and pistol in a cave near town, and thereby earned a $30,000 reward. Plenty of other canyon country mysteries still remain to rivet our imagination. Our need for the unknown is just one more reason to preserve what Thybony calls “big reaches of distance lying close to the human heart.” Weaned on Hollywood fare, we need our Western folk heroes — like Hayduke or the Lone Ranger — to keep riding forever, into the sunset. University of Utah Press, 2016.